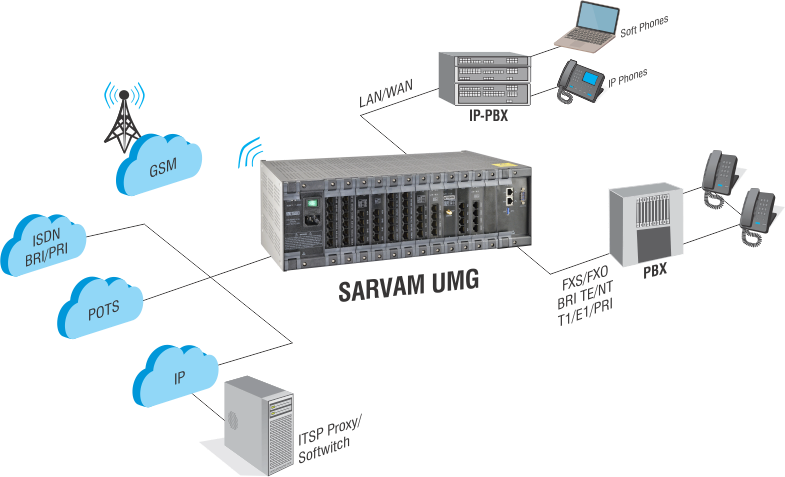 Matrix SARVAM UMG is a Universal Media Gateway offering connectivity of VoIP, GSM/3G, T1/E1 PRI, ISDN BRI and POTS networks on a single platform. Matrix Universal Gateway links an organization’s existing infrastructure to the new age communication networks ensuring right connectivity and least cost for each call. The Gateway is an ideal solution for workplaces such as call centers, ISP, ITSP, wholesale terminators and organizations experiencing high call traffic on per day basis. With universal routing combined with least cost routing, telephony costs can be significantly reduced. To avail cost benefits, system can be programmed to select the most economical network on the basis of number, time, network, port and combinations of each. The universal slot architecture allows selection and configuration of interface options to match the exact call traffic requirements of any organization. Matrix VoIP Gateways help businesses manage huge call traffic over mobile networks and drastically cut down recurring telephony bills. VoIP Gateways bridge the gap between VoIP and traditional communication networks enabling corporates to avail advantages of the latest communication technology. IP network offer benefits such as call routing, call signaling, voice compression and many more that allows efficient handling of voice and data using existing communication infrastructure. GSM extends the reach of businesses as compared to fixed lines by converting fixed-to-mobile calls to mobile-to-mobile calls. Matrix manufactures VoIP GSM Gateways that enables traditional extensions to connect to IP Phone system and place outbound calls over the desired network. The Gateway interfaces with an existing PBX system via FXO/FXS, BRI, and PRI or over IP. The Gateways work as an adjunct to existing telephony infrastructure, with no need to replace any existing equipment.